I'll be happy with any cutesy Valentine items. I tend to prefer animal themed things - For instance if it's a choice between a little puppy or a cupid I'd pick the puppy lol. frankenstein), spongebob, and I'm a huge film fan so I like general movie related things. I like pony merch too! So any generation notebooks, bags, pens/markers, cups, stickers, jewelry, etc. Is anyone a fan of coffee or tea? I love the smell of coffee but do not drink it, tea on the other hand I drink every day and love to try new kinds! I like tea and always try new kinds like emery. I also like coffee - we've a Senseo Pad Machine- so I can only use coffee Pads for Pad Machines. I do not like tea, but I drink coffee on occasion. I love tea more than probably any other beverage. I can't stand coffee at all in any way shape or form. My bday was in october. I like coffee and tea! I love tea! There are 10 varieties at any given point in my house. TEA all the way! I'm a heavy tea drinker; I go through at least three cups a day and sometimes more. I have yet to find a kind of tea that I refuse to drink My favorite has to be Celestial Seasoning's Imperial White Peach or their Country Peach. I think I like just about anything that's peach flavored. A custom of my persona would be absolutely amazing. 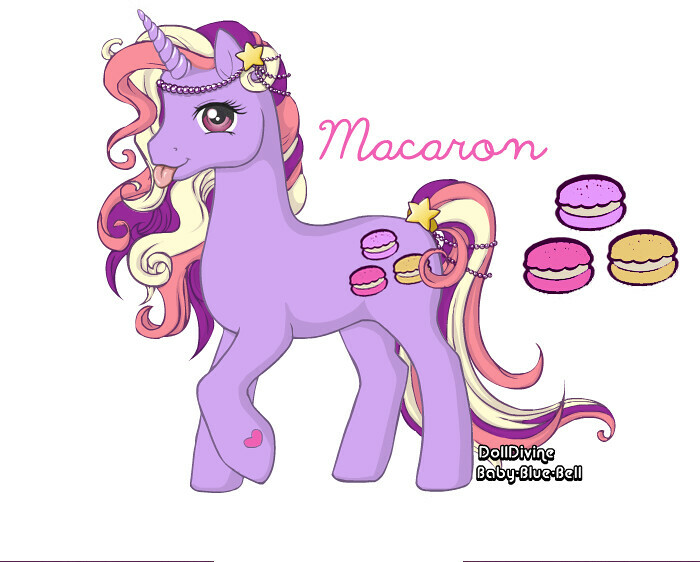 And I do appreciate customs;) McDonald ponies would be great because I had to sell all of mine to pay the bills when I didn't have a job >_< Baits are totally acceptable because I LOVE to restore. YES! Especially a so soft rearing stand. Any shade of purple. I also like green a lot. My kitchen and bedroom are cherry red and grape purple with hints of gold and my bathroom is neutral greens and tans. I made my art desk/computer room area a magenta and lime green theme because they're peppy and inspire me to get things done. I'm a huge candle addict, but have two major requirements on them. I won't burn any candle that contains lead in the wick because it's bad for your health to inhale the lead-laden smoke. The second is no essential oils in candles. I am owned by a cat and cat's can't properly metabolize essential oils in any form, so I try to avoid those for her health. Lotions... Not so much. I like Burt's Bees lotions, but not really anything else. Bath accessories- Salts! I'm a fiend for baths and love to add salts. Auria Cacia salts are my favorite, but I'm really not picky as long as they're not artificially fragranced (parfum on the ingredient label). Baths are my meditation and de-stressing time, so anything that helps with that is appreciated. I could really use a new bath pillow... The current one has a hole in it and I keep re-inflating it because I don't want to make the hour trip into town to go get a new one. I'm a pretty grateful person and appreciate any extras included. I prefer useful and beautiful things over kitchy dust catchers. My cat Misty loves boxes, so the box my swap stuff comes in is considered an extra! Chocolates are great, as are anything ginkgo, dragonfly, Celtic knot, or raven related. I also enjoy fairy gardening and am obsessed with moss and ferns. As mentioned before, a little snowshoe siamese kitty named Mist Luin, aka Misty. She's my only child and I adore her to death =) She's currently having some intestinal issues, so any treats for her would have to be freeze-dried meats, such as shrimp or chicken, or greenies. Feathers are her favorite toys, as are a stuffed Chewbacca, and string. Will anybody be celebrating a birthday during the swap? Yeahhhh shopped for my ponies! Now deciding on extras... :D!! Thanks Matcha for the sig and Reiya for the avatar! I already did some shopping today too. I'll take any excuse to go shopping, haha! I have no birthday coming up. Mine was back in October. I love love love tea, especially green and lemony one! I can't stand coffee though. Of the newest McD ponies I have Twilight Sparkle, Rarity, Applejack and Pinkie Pie. Any others would be awesome! I love G1 accessories, especially brushes, combs and ribbons. I don't need any playset accessories though. I'm sure I will love whatever my partner includes However.. My favourite animal is a panda, I love anything to do with Japan and China, I play a LOT of video games, black eyeliners would be very handy for me also. No kids yet, I have two kitties; Miffy and Suki. They love treats. I also have a little baby hamster, Jenson! 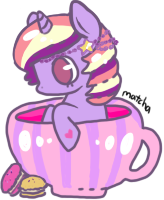 I love coffee, different flavours would be cool! I don't drink tea. One other thing I wanna mention for my partner is that I am collect Little Pretties kitties and puppies by Mattel. I need almost any. My LP grail is Flutterina the pink puppy. There are a couple on eBay for a decent price that can be an alternative to a pony if you like if any of the ones on my list are too pricey. Gazzy, glad to see I'm not the only one with the errors causing double posts! I've tried editing my second one to be shorter, but it just won't let me. Mine would have to be Rarity or Twilight Sparkle. I love Twilight's colors and personality, but I keep finding that I have more in common with Rarity's creativity and business sense. And it doesn't hurt that they both have purple hair! I'm having a terrible time trying to post for some reason- I keep getting errors. When it's resolved I'll be editing my previous post to answer the additional questions that have come up.